The Calcutta Scottish was a regiment of volunteers of Scottish descent raised in 1914 as an infantry regiment of the British Indian Army. The regiment formed part of the army reserves in Auxiliary Force, India (AFI). The regimental dress uniform was Hunting Stewart tartan. The regiment was disbanded following India’s independence in 1947. An attempt was made to raise 2 kilted companies of “Calcutta Scottish” within the Calcutta Rifles, but apparently without success. This may account for the date for the raising of the Regiment being given as 1 Aug 1911 in Major Donovan Jackson’s work “India’s Army”. On 1 August 1914, The Calcutta Scottish Volunteers were formed as part of the Indian Volunteer Force. Kings and Regimental Colours awarded. The regiment probably deployed only as individual reinforcements. Some officers are known to have gone to East Africa, but there is no other record of deployment as a unit.There is reference to Calcutta Volunteer Machine Guns armed with Maxim guns which may have included officers and men from the Calcutta Scottish. On 1 April 1917, the regiment was redesignated the 44th Calcutta Scottish. In 1919, the 44th was called out for over 2 months to deal with “communal riots”. On 1 October 1920, the regiment was redesignated The Calcutta Scottish (Army Auxiliary Force, India) and in 1921 included a Light Motor Patrol armed with Maxim guns (later Vickers, then Lewis, then Brens) but mounted in private cars. In 1921 the Prince of Wales visited the East in HMS “Renown” and on a visit to the city on 24 December inspected the Calcutta Scottish. In 1926 the unit was again called out for over 2 months, reason not known (possibly riots?). The unit was inspected again by the Prince of Wales. in 1928. In 1930 the unit was called out as Aid to the Civil Power for over 2 months (in small detachments, it was called out 18 times). It provided a detachment for Operation CREEK, a special operation against Axis shipping in Goa in 1942. The lead unit was the Calcutta Light Horse, although some members of the Calcutta Scottish also took part. (See the book “The Boarding Party” by James Leasor). In 1946 the regiment was reorganised to consist of an HQ, 2 companies and 4 Motor platoons, and disbanded in 1947 upon India’s independence. Jacket: 1920: Scarlet jacket with white facings. By 1946: Scarlet jacket with yellow facings. Kilt: Hunting Stewart tartan. Rarely worn during WW2. Glengarry: 1914-20: Diced Green and white. By 1946: Royal blue with same colour ribbons (Argyle?). Sun helmets worn a lot of the time. Also red and black check/diced. Hose Tops: 1914-20: Green and white. By 1946: Tartan with red flashes. Also red and black check/diced. Badge: The Cross of St Andrew with the coat of arms of Calcutta superimposed, in the upper angle of the cross: a crown. Motto: Per Adua Stabilis Esto. Regimental Silver: Passed originally to London Scottish (but no further knowledge), seen in Edinburgh Castle in 1951. Regimental Journal: “Calcutta Scottish Regimental Chronicle”. Operation CREEK was described in the book “The Boarding Party” by James Leasor. A “factional” account, in which the Calcutta Light Horse, reinforced by some members of the Calcutta Scottish raided the neutral port of Marmagoa on 9 March 1943. In the port, a German ship the “Ehrenfels” had been providing information to 3 German U-boats, on the movement of Allied shipping. As result, some 250,000 tons of British shipping had been sunk over a period of 45 days. After a journey from Calcutta, via Bombay, in the Hopper Barge “Phoebe” the Ehrenfels was boarded and destroyed along with two other German ships, in addition to one Italian ship. ‘The Sea Wolves’, released in June 1981, was a film of the book with Gregory Peck, Roger Moore, David Niven and Trevor Howard. It was actually filmed in Goa. The Royal Hong Kong Regiment (The Volunteers) (RHKR(V)) formed in May 1854, was a local auxiliary militia force funded by the Government of Hong Kong and the British Government. During the imperial age, home defence units were raised in various British colonies with the intention of allowing regular army units tied-up on garrison duty to be deployed elsewhere. These units were generally organised along British Army lines. The first locally raised militia in Hong Kong was the Hong Kong Volunteers, a fore runner of what was to become the Royal Hong Kong Regiment (The Volunteers). Although the British government, as national government, was responsible for the defence of the territories and colonies, and held direct control of military units raised within them, the local forces were raised and funded by the local governments or the territories and as such The Royal Hong Kong Regiment was always a branch of the Hong Kong government. It was not a part of the reserve force of the British Army. The Volunteers did however form part of the ORBAT of 38 Gurkha Infantry Brigade and were under command of the Commander British Forces. These locally raised defence units met British military standards in organisation and efficiency. Many of the officers and NCOs attended training in the UK. Although Colonial/overseas British Territories’ auxiliary units may have no tasking under the British Ministry of Defence, and members may not be compelled to serve outside their territory, many serve voluntarily on attachment to British Regular and Territorial Army units. The Hong Kong Volunteers was formed in 1854 when the Crimean War led to a reduction of the British military presence in Hong Kong. To help bolster the defences at a time when marauding pirates were still a hazard on the China coast a call for local volunteers was made. A total of 99 Europeans were recruited, mostly British but with some Portuguese, Scandinavians and Germans also answering the call. However almost as soon as it was founded, it was disbanded when the threat of war in Europe receded, and Regular units of the British Army were once again able to resume responsibility for the security of Hong Kong. In 1862, The Hong Kong Volunteers was re-established and in 1864, they were called out to help subdue a serious outbreak of rioting between British and Indian soldiers. In 1866 it was disbanded again. However in 1878 Hong Kong Volunteers was reborn as the “Hong Kong Artillery and Rifle Volunteer Corps“. By 1917 it was renamed as “Hong Kong Defence Corps” and “The volunteers” were actively engaged in guard and patrol duties during World War I when, owing to the recall of the British forces, they were the only military unit left in Hong Kong. In 1933, “The Volunteers” acquired their first armoured car, it was equipped with an armour-plated body and mountings for two machine-guns. Later, four others were bought by the colonial government, the bodywork was outfitted by the Hong Kong and Whampoa Dock Company. These armoured cars all played an important role in the Battle of Hong Kong in December 1941. The volunteers, renamed the “Hong Kong Volunteer Defence Corps” (HKVDC), met their severest test in the bitter fighting that took place in the crucial weeks before the fall of Hong Kong on Christmas Day 1941. On 8 December 1941, HKVDC, deployed a total fighting strength of 2200 all ranks in 7 infantry companies, 5 artillery batteries, 5 machine gun companies equipped with Vickers machine gun and an armoured car platoon. While only seeing light action in the New Territories at the beginning of the Japanese attack, the Volunteers were heavily engaged on Hong Kong Island, especially during the key battles of Wong Nai Chung Gap and Stanley. Casualties among 3 Coy at the former, and 1 Bty at the latter, were extremely heavy. 1 and 2 (Scottish) companies also suffered heavy losses, as did 5 Bty. Out of the mobilised strength of 2200, 289 were listed either as missing or killed, and many others became prisoners of war. Some, however, made their way into China where the British Army Aid Group was formed to assist the Chinese Government in the struggle against the Japanese. A number of these men later made way to Burma where they joined the famed Chindits under General Orde Wingate. The services of the defence corps were later recognised by the award of 19 decorations and 18 mentioned in despatch for gallantry and good service. As a recognition of The Hong Kong Volunteer Defence Corps defence of Hong Kong during 1941, the Corps was awarded the battle honour “Hong Kong”. Coat of Arms of the Royal Hong Kong Regiment with Latin words which means “second to none in the orient”. In 1949, The Hong Kong Regiment were reorganised and became part of the Hong Kong Defence Force, which also included separate air and naval units. In 1951 the new combined defence force was granted the title ‘Royal’, and replacement colours were entrusted to the care of the regiment as successor to the defunct Defence Corps. In the early 1960s The role of The Hong Kong Regiment (The Volunteers) changed from that of an infantry battalion to a reconnaissance regiment equipped with six British Ferret armoured cars (each armed with Browning .30-inch machine-gun) were acquired. The regiment was reorganise to form a headquarters, headquarters squadron, three reconnaissance squadrons, an infantry company and a home guard company. During the 1967 leftist riots, “The Volunteers” were called out during the six-month disturbances in Hong Kong. By 1970 the naval unit was phased out and in 1970 the Royal Hong Kong Defence Force was itself disbanded-the two remaining member units, the Hong Kong Regiment and the Royal Hong Kong Auxiliary Air Force, officially becoming separate entities. At the same time, both were granted the ‘Royal’ title by Queen Elizabeth II, and the words The Volunteers’ were incorporated into the Hong Kong Regiment’s title. With its new title and colours, The Volunteers was reorganised as a light reconnaissance unit operating under the command of the British Forces Overseas Hong Kong. In the late 1970s The Volunteers was deployed to assist the civil powers over the problem of illegal immigration from China but as the problem grew from 1980 till 1992 The Volunteers was deployed to manned the defences of the Sino Hong Kong border. In the late 1980s to early 1990s The Volunteers was deployed to support the colonial government in controlling the flood of Vietnamese illegal migrants, commonly known as the “Boat People“. These includes manning temporary Vietnamese detention camps. The Sino-British Joint Declaration on the question of Hong Kong as a British Colony was finalised and the joint declaration was signed in Beijing on 19 December 1984. On 27 May 1985, instruments of ratification were exchanged and the agreement entered into force. It was registered at the United Nations by the British and Chinese Governments on 12 June 1985. In April 1992 the decision was finally taken by Security Branch of Hong Kong Government to formally announce that the Regiment would disband in September 1995. When the Japanese struck Malaya in December 1941, the “British” forces represented a wide variety of Commonwealth troops. Two Indian, one Australian and one British division eventually fought on the peninsula or on the island of Singapore, plus two “Malayan” brigades (mostly British battalions from the pre-war garrison). Indian State forces saw action, as well as locally raised formations. All of these units appear in our Tiger of Malaya game. 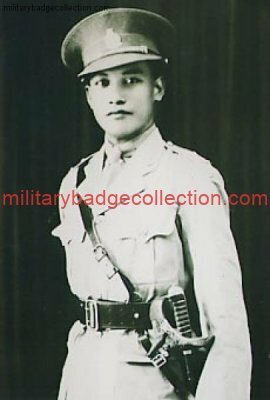 We looked at the Royal Malay Regiment in an earlier installment, and the incredible heroism of Lt. Adnan Saidi. In addition to the two regular battalions of that regiment, a large number of local men volunteered to defend the colony from the Japanese. Singapore, founded in 1819 as a trading post for the British East India Company, had never been assigned a very large garrison. Through the early decades of the 19th century a regiment of Madras infantry served on the island, giving way to a British regular battalion in 1873 and returning in 1900. The permanent Indian Army presence on Singapore ended in 1915, when troops of the 5th Light Infantry mutinied. Local contributions paid over 90 percent of Singapore’s defense expenses. A Volunteer Rifle Corps of about 1,000 men, including infantry, engineers and artillery, trained alongside the Indian and British regulars. After the First World War, this militia was expanded and given a much greater role in the colony’s defense. The new Straits Settlements Volunteer Force appeared in 1922, absorbing the Singapore militia and similar mainland formations. By 1939, the SSVF numbered four infantry battalions plus artillery, engineer, ambulance and signals contingents. An armored car company with locally made vehicles joined the force by 1941. The SSVF drew its members from Singapore (the 1st and 2nd Battalions), Malacca (4th Battalion) and Penang (3rd Battalion). Its sister force, the Federated Malay States Volunteer Forces, also mobilized four battalions. The two Singapore battalions and the Malacca battalion were assigned to the Singapore Fortress Command when the Japanese invaded Malaya, with the Penang battalion assigned to the Penang Fortress Command. Given the racial attitudes of the day, the two Singapore battalions were strictly segregated. Firts Battalion’s A Company contained Englishmen, B Company had other Europeans, C Company was Scottish, and D Company Eurasian. In 2nd Battalion, E Company was Chinese, F Company was Malay, and G Company was a Eurasian machine-gun unit. Second Battalion also oversaw the mixed-race signals unit. The Singapore Royal Artillery (Volunteer) was not a field unit, but instead supplied gunners for the “fortress” command’s coastal artillery. During the brief campaign, the volunteers served at the Sentosa coastal battery and manned air defense searchlights. The volunteer infantry appears to have had adequate light arms. Each battalion had trained an anti-tank section, but the gunners were not issued weapons for the campaign and served as infantrymen. Like Volunteer units in other parts of the Empire, the SSVF wore uniforms similar to British regulars, with the Scottish company wearing kilts. Unlike most of those units, the SSVF battalions trained alongside the regular battalions assigned to the Singapore garrison, and there was a surprisingly high level of social interaction between Volunteer and regular officers. 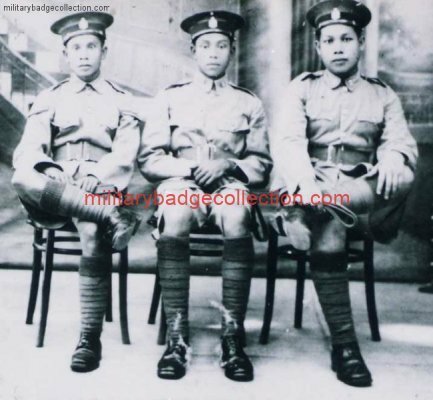 Unlike the Royal Malay Regiment, the SSVF accepted soldiers from all communities, including Chinese and Indian recuits. This made the battalions very popular in those quarters. Thanks to the efficient but informal networks of the overseas Chinese, Singapore’s Chinese community was well aware of the atrocities committed by the Japanese in Chinese cites over the previous four years and particularly at the fall of Hong Kong in late December. Chinese volunteers flocked to the SSVF, but few could be accommodated. The surplus were gathered by Lt. Col. John Dalley into an irregular band known as “Dalforce.” Posted to the western end of the island, not far from what became the Japanese landing beaches, the Chinese volunteers fought with great spirit if not much knowledge, knowing the fate that awaited them and their families should the defense collapse. When the Japanese landed made their first landings in force, Dalforce and some of the SSVF companies were stationed alongside 22nd Australian Brigade to meet them. Despite heavy casualties, the Japanese forced their way ashore and drove the diggers back. Along Bukit Timah Road, the remnants of the SSVF battalions, Dalforce and a battalion of Jind State Infantry attempted to hold the Japanese 5th Division, which had already shredded 22nd Australian Brigade. The Japanese came in waves, and the poorly trained “British,” their units quickly becoming interspersed, held their positions against several attacks. At some point during this fight Dalley appears to have become utterly berserk, and charged the Japanese armed only with his sword. His Chinese volunteers followed, armed themselves only with swords, axes and shotguns. The SSVF 2nd Battalion also became drawn into the vicious bayonet fight. Very few of the defenders survived. With the British capitulation on 15 February 1942, the SSVF formally ceased to exist and the British authorities told the men to go home. The Japanese felt differently, considering the SSVF men prisoners of war. All of the Chinese taken in arms, and many of the Malays, were massacred. Not satisfied with killing those in uniform, Japanese Gen. Tomoyuki Yamashita ordered “collection centers” set up where Singapore’s Chinese male residents between 18 and 50 had to report for screening. Those identified as “anti-Japanese” (by whatever definition the screening officers chose to apply at the moment) were taken to remote corners of the island and shot. A minimum of 8,600 Chinese residents were murdered during these operations in the first days of the occupation, but the actual total is believed to be many times that figure. 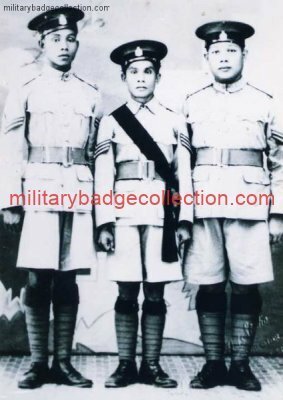 The Singapore Volunteer Corps (or Singapore Special Constabulary) was a militia unit established in 1854 as the Singapore Volunteer Rifle Corps. The Corps underwent several reorganisations and was known by various names through its history. In 1965, it was renamed the People’s Defence Force. The idea for a volunteer corps to supplement the local constabulary for tighter internal security was first raised in 1846. The first corps, the Singapore Volunteer Rifles Corps (SVRC), was formed after the outbreak of riots between Chinese secret societies from 5-17 May 1854. The conflict caused widespread unrest and loss of life on the island, and was severe enough for the police to require the support of the military, some marines, European residents acting as Special Constables, sepoys and even convicts to restore order. More than 400 people were killed and 300 houses burned down. In view of the escalating violence from the Chinese secret societies, and the outbreak of the Crimean War, it was decided that a volunteer corps of European residents, led by British officers, would heighten security for the settlement. It was initially run on private funds, and members had to use their own weaponry. Formed in 8 July 1854 with the support of the Governor, Colonel William John Butterworth, the SVRC was one of the earliest official volunteer units in the British Empire. In 1857, the Indian Government passed the Volunteer Ordinance, which placed the SVRC under government control. The SVRC was disbanded in December 1887 when its numbers dwindled to a small half company. In February 1888, the corps was revived as the Singapore Volunteer Artillery, and was the first unit in the British Empire, regular or auxiliary, to field the Maxim Gun. The guns arrived in 1889 and were funded by donations from the Sultan of Johor, members of the various communities in Singapore and prominent businessmen. By 1901, the SVA’s diverse composition of sub-units necessitated the change of name to the Singapore Volunteer Corps (SVC). It comprised artillery, infantry, engineers and rifle sections. During the First World War, the SVC helped to quell the Sepoy Mutiny of 1915, which resulted in the deaths of 11 volunteers. In 1922, the SVC was absorbed into the Straits Settlements Volunteer Force, forming the 1st and 2nd battalions of the SSVF. The Corps was involved in the defence of Singapore during the Second World War. The end of the Japanese Occupation saw the SVC being revived in 1949. In 1954, with the disbandment of the SSVF, the Singapore Volunteer Corps were absorbed into the Singapore Military Forces. The Corps assisted in defence during the Malayan Emergency, and the at the height of the Indonesian Confrontation, was deployed to protect vital installations in Singapore and southern Johor against saboteurs. With the independence of Singapore and the passing of the People’s Defence Force Act in 1965, the SVC was renamed the People’s Defence Force and its units were absorbed into the Singapore Armed Forces as full-time National Service operational battalions. Many volunteer officers were also transferred to the regular army. The volunteers continued to play a role in national security, which included the training of part-time National Servicemen when National Service was introduced in 1967. However, with the introduction of compulsory full-time national service and dwindling volunteer enlistment, their role diminished. 101 PDF, the last volunteer battalion, was disbanded in March 1984. The Singapore Infantry Regiment is the main formation of the Singapore Army. It consists of nine full-time battalions and a number of National Service (NS), or Reservist battalions. The 1st Battalion, Singapore Infantry Regiment (1 SIR) was formed in March 12, 1957 against the backdrop of self-government for Singapore. Recruitment began on 4 March 1957 with only Singapore citizens and persons born and bred in Singapore were recruited. Out of a total of 1,420 applicants, 237 were initially accepted for training. It was intended that 1 SIR together with another battalion would form part of a regiment within a brigade group in the Singapore Military Forces. Self-government for Singapore in 1959 gave 1 SIR the opportunity to mount the Istana Guards in place of the Gurkhas, while the battalion was presented with Queen’s and Regimental Colours in 1961. The following year, the 2nd Battalion was raised. For two years between 1963 and 1965, Singapore was part of Malaysia, and the regiment was renamed the Malaysian Infantry Regiment. On Singapore’s independence in 1965, the regiment regained its former name. In 1967 two more battalions, the 3rd and 4th, were raised as part of the move towards National Service. 1 SIR and 2 SIR were also converted to NS battalions. Four further battalions were raised over the next few years, although 7 SIR and 8 SIR were eventually re-roled to become the 3rd and 2nd Battalions, Singapore Guards. Currently, there are eight full-time battalions, each of which is assigned to an infantry brigade in one of the army’s three Infantry Divisions. This is alongside two per brigade of NS battalions.